My daughter in first grade has been given an ongoing homework assignment of reading 30 minutes per day after school. It has been challenging to find plenty of books to keep her interested in continuously reading plus that are also at her beginning reading level. So it was nice that as a Care Bears brand ambassador, A Geek Daddy was provided the opportunity to review the new "Sharing With Care Bears" personalized book from Twigtale.com. The Twigtale service provides a soft cover book with a themed story template, like the Care Bears, and lets people personalize it by inserting pictures and customizing some of the text. The service is really easy and convenient to use. Just visit the Twigtale website and select the story template you want to use which include Doc McStuffins Big Sibling Book, Everybody Gets Scared, Me & Daddy, Learning To Stand Tall & Act Brave Versus Bullying, and Sharing With Care Bears, among other topics. 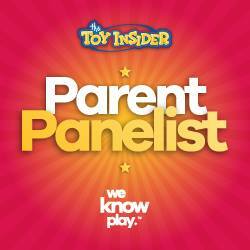 Themes include safety teaching stories, identity and self esteem, ages & stages, family changes, learning, and well being. There is also a category where you can completely create your own book from scratch. As a parent of two children that have severe food allergies, I was pleased to see that Twigtale has partnered with FARE (Food Allergy Research & Education, a leading non-profit that advocates for the 15 million Americans that have food allergies) in creating a personalized book to help parents explain specific food allergies to children. "My Food Allergy" is personalized with photos and specific details about a child's allergy to make it an engaging and effective way to help children understand what it means to have a food allergy and how to stay safe. Plus a portion of this particular book's sale is donated back to FARE to help support its mission of finding a cure for food allergies and helping keep individuals with food allergies safe. Based upon our family's satisfaction with Sharing with Care Bears, we are probably going to go back to Twigtale to create My Food Allergy books for each of our twins who suffer from life-threatening peanut allergies. Once you've selected your story template you are asked some questions based upon the theme of the book. For the Care Bears it was really easy as they just wanted to know my child's name to insert periodically throughout the text of the story. They also asked for a photo to use on the cover of the book. You just need to upload a digital photo from your computer and you're all set. Additionally there is an author designation which you can customize based upon who the book is from such as Mommy & Daddy, Grandma & Grandpa, Aunt Sue and Uncle Joe, and so on. The website then allows you to flip through the pages of the book inserting additional pictures or editing text in specifically designated areas. For example on the page below you could add a picture plus alter the text as desired where the story talks about who your child's best friends are. 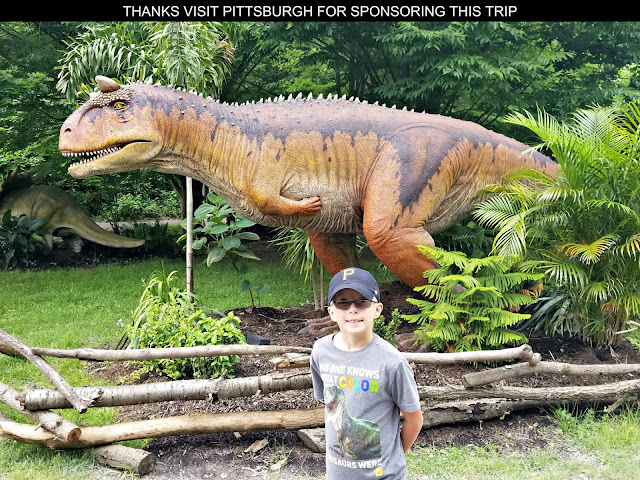 Here's another example where you can add in another personalized picture and provide your own text describing the activities that your child likes to do with his or her best friends. 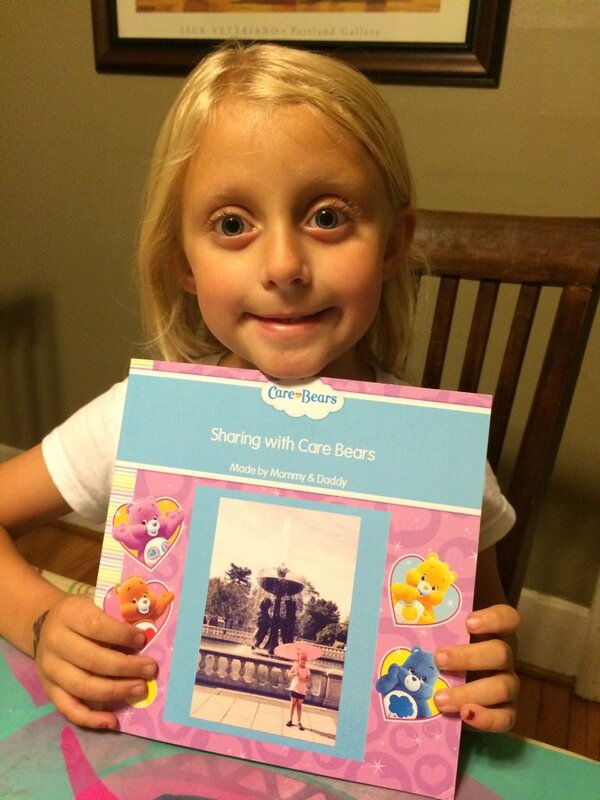 Sharing with Care Bears is 21 pages and provide the opportunity to add pictures and customize text within 6 of them. It's really easy peasy to put together. Wow did I just say easy peasy? You know I spend a lot of time around first graders don't you?! As I mentioned the book was very easy and convenient to customize on the Twigtale website and it arrive at our doorstep lickety split. We received our personalized Sharing with Care Bears book in the mail three days after we had ordered it. My daughter has really been thrilled to have a Care Bears book that includes her in the story. As parents, we really appreciate that the text is simple enough that early readers can easily read it on their own. So not only has this book provided a nice story for my daughter to enjoy but it also has been a great aid in helping her practice her reading by allowing us to include it as part of her first grade reading assignment. For more information about ordering your own personalized children's books, visit www.twigtale.com. These books cost $20 plus shipping and handling. They normally can be delivered within a week after an order has been placed. DISCLAIMER: As a Care Bear brand ambassador, A Geek Daddy blog received a complimentary Sharing with Care Bears book to review from Twigtale. No financial compensation was provided. The opinions expressed are my own. What a great idea! Kids always love things about themselves. This would make a really nice Christmas present. Thanks for sharing. Love this. What a sweet idea. I'm considering one for our 8 year old granddaughter. That's great idea for getting some new books. But I use scholastic to order all of my books for my girls they are very reasonable and they ship pretty fast. I love personalized books! This is a great gift idea for the holidays and something I will have to get my daughter. This is such a sweet idea. I know my kids would be so excited to read a book with their pictures in it! This is awesome. A great gift for the holidays. Thank you for sharing. Personalized books are awesome, my cousins bought me some when I was a kid too. Yay, your daughter finally got a girlie freebie. I always chuckle with all of the cool boy toys she receives. This might come in handy this holiday season. Personalized children books sounds like a great gift idea!